The very reliable Pesseux 7001 mechanical movement used occasionally by the likes of Blancpain and others, was so well regarded that it wasn’t long before the ETA 7001 appeared (bought by ETA). Started off life in 1971 with 17 jewels, 21,600 vph, non hacking, with a 42 hour reserve and very thin, was a great favourite with all sorts of Brands and Edox liked them for some of their Les Bemonts models. 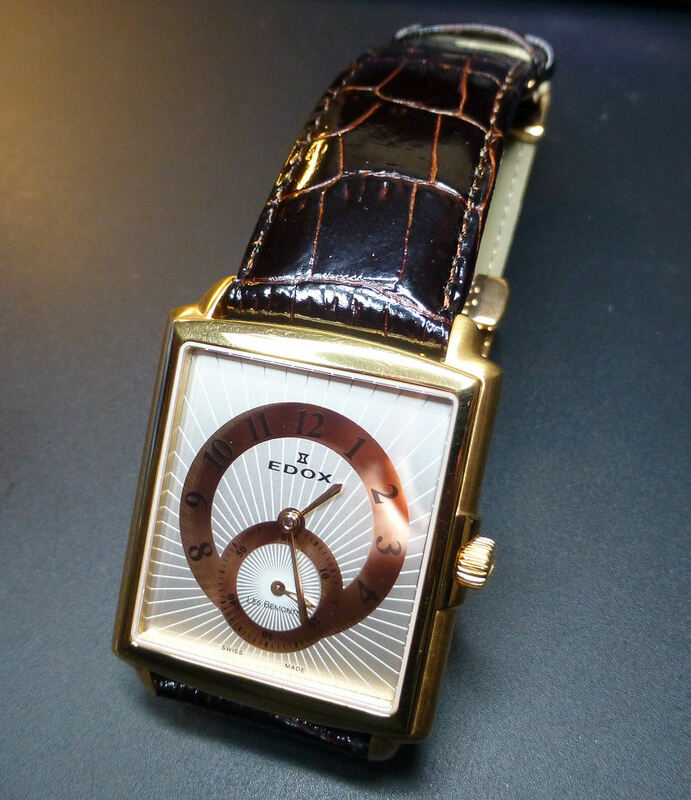 Edox 2008 Les Bemonts manual wind Dress watch. 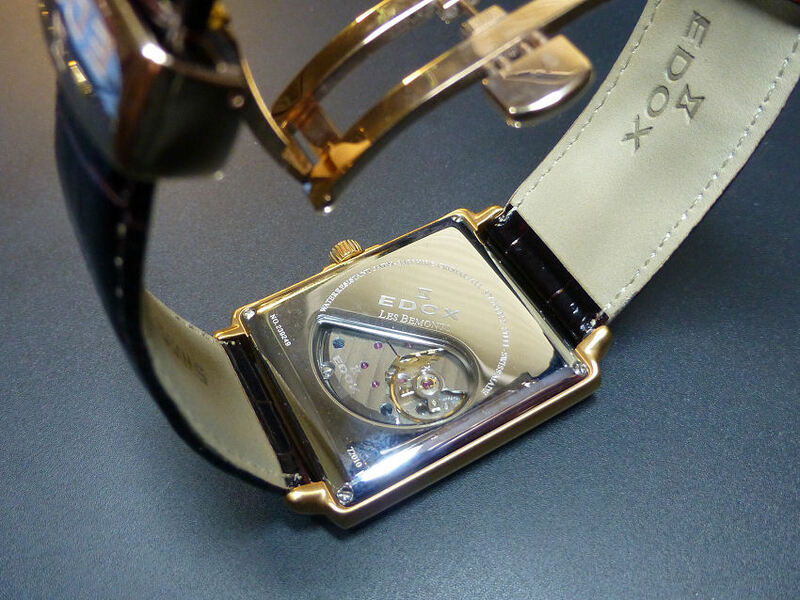 This is the unusual rectangular Les Bemonts model circa 2008 from Edox. A well sized model at 34 mm wide and nearly 45 mm lug to lug and only 7.9 mm depth, shows just how thin this ETA7001 hand wind movement allows neat case design. The crystal is flat Sapphire, the dial features a sub seconds dial and gold and white background with gold hands, Edox “hourglass” logo and Swiss Made at the foot. 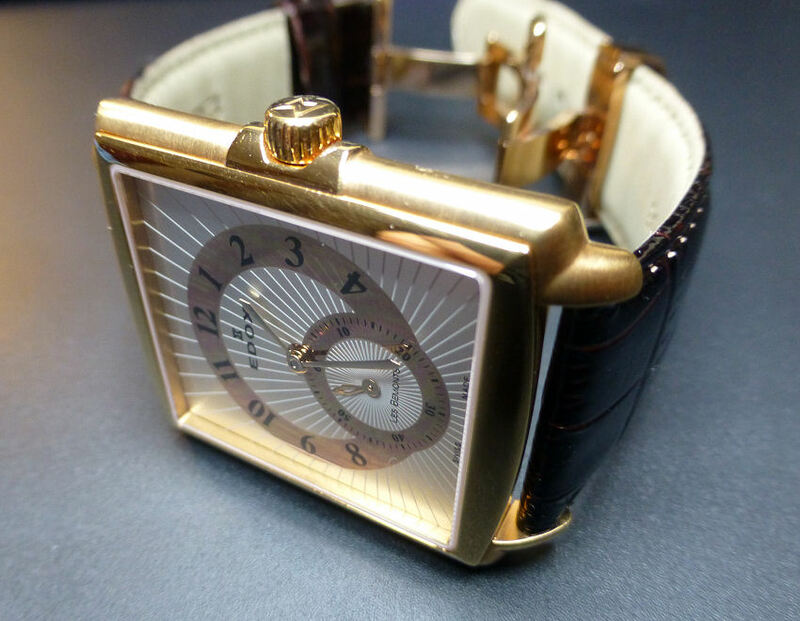 The case is stainless steel, gold plated with an exhibition back with part cutout to view the 7001 movement. The watch is Water Resistant to 5Bar. The 22 mm lug measured strap is high quality leather fitted to an Edox deployment (with extensions) mechanism, which is one of the most comfortable I’ve worn as it lies very flat on the wrist. Great on the wrist Edox with excellent Edox deployment strap. This particular watch was purchased in 2008 in Holland and according to the retail slip was €899 (Euros) and it the recent Auction I managed to get it for just £130. Exhibition stainless back showing the ETA 7001 movement. Now considering this watch has obviously not been worn, comes with box, attached watch protection stickers, instruction booklet, plus being in absolute pristine condition, no marks scuffs or anything other than showroom condition, I reckon this is indeed a bargain – so I’m well pleased. 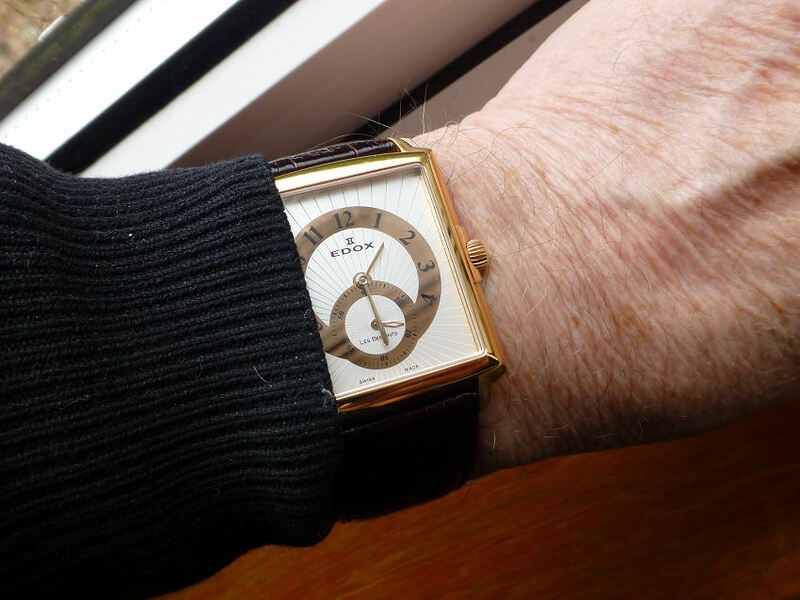 Do I need what is after all a relatively modern watch like this? – well yes I do actually as I’ve found a new niche in collecting and that’s great “dress” watches that I can wear – and this is certainly one of them. A great price for what is a pretty decent hi-grade ETA movement, Sapphire crystal, elegant design case and dial, plus a great fit on the wrist, for just over £100 – I think that’s a good deal. Probably one the good reasons for visiting Auctions and especially IF you can manage at a fair price for you. It can offset the quite extortionate “fees” that Auction Houses are applying these days – one of my gripes I know, but I’m going to keep going on about it. Let’s face it many Auction houses would be in severe decline if it were not for the Internet – as it draws in a huge number of potential buyers – maybe they need to recognize this and give Internet bidders a discount for taking the trouble to visit their auction and bid, rather than try to screw more cash out of us all. You never know it could be a winning idea, for the Auction house as well as the web punter.